by Dr Mary Taylor, RGC Adviser, SPC. A one day workshop on law and policy issues affecting the management (conservation and utilization) of plant genetic resources was held in the Agriculture Headquarters in Kolonia in Pohnpei. There were a total of 27 participants (including the resource persons) representing both the public and private sector. Presentations were given by Ishmael Lebehn, Acting Secretary to Economic Affairs for the FSM National Government, Marion Henry, Deputy Assistant Secretary for Fisheries, FSM Department of Economic Affairs and Mary Taylor, Regional Germplasm Centre Adviser, Secretariat of the Pacific Community. The presentation from Mr Lebehn discussed both the Federated States of Micronesia (FSM) national laws and also the State Laws. National laws include the Plant and Animal Quarantine Law, for the protection of agriculture and the general well-being of FSM, and also the Food Safety Law. The States have authority over their resources with laws on quarantine, conservation, environment etc. FSM has ratified the Convention on Biological Diversity (CBD), and are working to fulfill their obligation to the Cartagena Biosafety Protocol, through developing a biosafety framework under the UNEP-GEF project. The problem in FSM, as with many Pacific Island countries, is the lack of resources to implement these agreements. There is an officer in the AG office with responsibility to develop an access and benefit sharing law – this is being developed initially at the national level and will then be discussed at the State level later. The presentation from Marion Henry focused on the CBD and its implementation. There was some concern that much had yet to be done in this area (as with many countries in the world). The State has the responsibility for managing the biodiversity within the State and the marine waters to the edge of the Territorial Sea (12 nautical miles) whereas the FSM national government has responsibility for managing the conservation of all natural resources within the 200-mile limit, that is, the Economic Exclusion Zone (EEZ). The FSM national government sign international agreements but then to a large extent it is up to each State to implement and enforce. With bio-prospecting, an import permit can be obtained from the Historical Preservation Office (FSM National government), but the States also issue import permits. All the States have constitutions which respect the conservation and sustainable use of genetic resources, and traditional rights and practices, but there is no mechanism for access and benefit sharing, and State constitutions can vary with the different States. The presentation from Mary Taylor looked at the historical context of the laws and the policies which impact on plant genetic resources management, highlighting that legal agreements tend to reflect the current circumstances, hence the diversity of existing agreements. Some time was then spent detailing the major instruments, those of protection, that is, IPR agreements and those of conservation and use, that is, the Convention on Biological Diversity (CBD) and the International Treaty for Plant Genetic Resources for Food and Agriculture (ITPGRFA) – focusing on the background under which they were negotiated, the negotiators and their objectives. The discussion on IPR agreements defined intellectual property rights, discussed the implications of the TRIPs agreement and outlined the criteria necessary for patent legislation and plant breeders’ rights. The International Convention for the Protection of New varieties of Plants Act (UPOV) was described as an example of a sui generis IPR protection system, and the whole issue of the suitability of Plant Breeders Rights (PBRs) in the Pacific was raised. The discussion on the CBD considered the objectives of the CBD, and what was happening in the Pacific region – highlighting that although 14 countries are Parties to the CBD, countries were still in the process of developing ABS regimes. The ITPGRFA was also discussed – what are the advantages to the countries, and are there any disadvantages. Access and benefit sharing for Karat banana – a banana variety rich in carotenoids. Since a paper was presented at an International Banana Congress in Malaysia in 2004 there has been considerable interest in the Karat banana from outside of the Pacific region. The meeting decided that determining a mechanism for access and benefit sharing (ABS) was of prior importance because of the keen interest in Karat banana, and so the remainder of the workshop time was devoted to this issue. Technology transfer and capacity building – Group A offered training in genetic manipulation and assistance with the establishment of basic facilities. Group B argued that this level of technology was not required in their country – could Group A help in some other way – with training that was more appropriate. Shortage of banana planting material was identified as a constraint to local growers – could the institute represented by Group A assist with the establishment of a micropropagation facility and provide the necessary training. Another option suggested was support for value adding – both training and any infrastructure required. As Karat banana was the desired germplasm – a baby food production unit was suggested as appropriate value adding. Group A wanted to patent the process – this raised the question of patents – if the process is patented, does the same patent also cover the product? What was not raised by both Groups but was raised by a workshop participant from the floor was who owns the carotenoid gene(s). This stimulated much discussion - Group B felt that the rights to any genes from the Karat banana belonged to the country, whereas Group A felt that because they had extracted the gene, and the resources involved, they should at least have some rights. Group B requested and Group A agreed that at all times the sovereign rights of the country over the Karat germplasm , that is, the banana itself, would be acknowledged. Group A proposed scholarships for students from the country – although it was agreed that this could be a good form of capacity building, it was noted that (a) the scholarships would have to be relevant and (b) those receiving scholarships would have to be employable on return. There would be no point in providing scholarships for Masters and PhDs if positions requiring and using these qualifications were not available in the country. Both groups agreed that initially a contract would be drawn up based on research only and that if there was any indication of commercialization then a second contract would be required. This debate raised some interesting points – although the aim of the research is initially food security, what is the market potential? How much control would there be, or could there be over the varieties with the newly inserted carotenoid genes, especially as far away as Africa. Could these new varieties be important for value adding – was there a need for a market study to be carried out by the overseas institute to look at these issues? Is there also an issue with import substitution? The question of breach of agreement was raised – if this happened, what would be the arbitration process. The suggestion was made that this could be addressed by the representatives for the overseas institute, the country and a third party. Access and benefit sharing frameworks – there is an officer in the FSM national government’s AG office responsible for development of an ABS mechanism, yet little information has been forthcoming on progress. The States need to get an update on progress made in this area. There are many researchers currently wanting access to both the marine and land resources of Pohnpei. Permits can be issued by both the State and the national government through the Historical Preservation Office. However the correct protocol to use is not clear and also the issue of harmonization between the protocols requires attention. It is essential that there is cooperation between all the relevant agencies to achieve harmonized outcomes – this highlighted the possible need for an inter-agency committee on IPR/ABS issues. There is a need for more information on these PGR law and policy issues – general circulation of information is poor at all levels. SPC Genetic Resources would provide information on PGR law and policy issues. Information is already distributed on “PGR news from the Pacific” through PAPGREN but specific information could be supplied on request. Ngaremeduu Biosphere Reserve (Palau), the first in Palau, covers a large bay and coastal area with dense mangrove swamps. Marine core areas protect economically important crab, fish and clam species. Populations of three states in Palau prepared the nomination using a community approach. The Network now consists of 482 sites in 102 countries. From Dr Lois Englberger in Pohnpei. I would like to share with you our recent article in the Kaselehlie Press newspaper, in case that you would like to have it electronically. This was written by Amy Levendusky, who is a Peace Corps volunteer helping the Island Food Community of Pohnpei in its work. For those of you not familiar with Mand, it is a Pingelapese community on the main island of Pohnpei. Pingelap is one of the outer atolls of Pohnpei. Members of the Mand community continue to meet together twice weekly to provide important information on local crop varieties featured in the Mand Food List. This is part of the on-going project entitled, "Documentation of the Traditional Food System of Pohnpei", coordinated by the Island Food Community of Pohnpei. Each time the Mand working group meets, in addition to providing traditional knowledge on local foods, a local recipe is also prepared by one of the women and shared with all the participants. These recipes are being photographed, recorded, and then sampled. This project began in May and will be completed by the end of August. During the following months of documentation, community members will identify which local foods have the most potential for promoting in a 2-year intervention campaign. This is aimed at assisting the residents of Mand to meet their food needs, increase self-reliance, improve health and nutrition, economic savings, and protect agricultural biodiversity. This campaign will begin in September 2005 and finish in September 2007. The sharing of traditional local recipes by the women of Mand is a valuable addition to this project as it will assist the community members in deciding which foods to promote, having high nutrient content as well as being highly acceptable. The project is being led by Kiped Albert and Podis Pedrus of Mand, and Adelino Lorens of Pohnpei Agriculture. The research team includes Dr. Lois Englberger of IFCP, Douglas Nelber of the Historic Preservation Office, Yumiko Paul of the Pohnpei Department of Health, Welsihter Hagilmai of the College of Micronesia-FSM Land Grant Program, Amy Levendusky of Pohnpei Agriculture/ Peace Corps, Mari Yanagisaki of the Japanese Overseas Cooperation Volunteers, and Sarah Shaeffer of Emory University. Thanks are extended to Nelihser James for preparing her delicious recipe of Kariana listed below. Peel and grate the giant swamp taro. Place balls in a baking pan. Pour the coconut cream over the shaped pieces. Option: Mix the coconut cream into the grated taro, make hole, and fry. For the greatest health benefits, choose yellow-fleshed varieties like Mwang Tekatek, Mwahng Pwiliet, Smihden, Songpwong Weneu, and Saleng Walek. Two of these will be of relevance to the Pacific. In Uganda, more than 38% of children under the age of 5 years are stunted due to malnutrition. Vitamin A deficiency and iron deficiency anemia are major public health problems in Uganda. Researchers in Australia, Uganda, and the United States will attempt to genetically modify Ugandan bananas -- a staple food in that country -- so that they contain increased levels of pro-vitamin A, vitamin E, and iron. These essential nutrients are lacking in the diets of more than a third of Ugandan children. The country is the second largest producer of bananas in the world, and Ugandans eat an average of one kilogram of bananas each day. Lead investigator: Richard T. Sayre, Ohio State University, U.S.
Dr. Sayre’s team will attempt to genetically modify cassava, a starchy root crop that is the staple food for more than 250 million people in Africa, yet provides less than 30% of the amount of protein needed for a healthy diet, and just 10-20% of the required amounts of vitamins A and E, iron, and zinc. Cassava can also be toxic if not prepared properly, due to low levels of naturally occurring cyanide. In addition to increasing the levels of key micronutrients in cassava, researchers will modify the plant to eliminate naturally occurring cyanide and to allow it to be stored for longer periods of time. Prof. Randy Thaman of USP on how biodiversity is the key to food security. The Traditional Tree Initiative on how indigenous tree species are essential for sustainable agriculture and economic development in the islands. Floriculture in Fiji, where rural women are being taught how to grow and market cut flowers as a new way of boosting their incomes. Breadfruit farmers in Samoa have been given the green light to export their produce to New Zealand, thanks to the installation of a heat treatment plant. From a LAISA Magazine article by David Bourma (FAO). Thanks to Danny Hunter (SPC-DSAP) for pointing this out. "FAO, together with governments, UNDP-GEF, UNESCO, international organizations, NGOs and civil society organizations, has developed a global initiative to safeguard the world’s most valuable indigenous and traditional agricultural systems: the Globally Important Ingenious Agricultural Heritage Systems (GIAHS) initiative. Worldwide, valuable agro-ecosystems and landscapes have been created, shaped and maintained by generations of farmers and herders. These agri “cultural” systems testify to millennia of highly interdependent co-evolution of human societies with their natural environments, and they are increasingly being recognized as a major resource for food security, poverty alleviation, and community resilience. However, many factors threaten the sustainability of these agricultural heritage systems and for that reason FAO has developed the GIAHS initiative to help safeguarde these systems. A key concern of the initiative is to allow these systems to adapt to the changing surroundings and to strengthen their capacity to provide for peoples’ livelihoods." Should we submit others from the Pacific? What about the maa islets or the atoll Giant Swamp Taro systems? Pleased to see taro-based gardens, and certainly giant swamp taro should be added. How about other traditional systems such as yams, plantains, breadfruit, etc, including mixed cropping. Cabinet has approved the development of a National Rural Land Use Policy for Fiji. Cabinet based its decision on the submission by the Minister for Agriculture, Sugar and Land Resettlement, Ilaitia Tuisese, of the report on Land Use Practices and Related Issues. Mr Tuisese explained that currently Fiji does not have an integrated rural land-use policy or national land-use plan, although there is an existing legislation called the Land Conservation and Improvement Act. He said that there is a need to develop the rural land use policy for wise, holistic decision making in the allocation of resource for different uses and sustainable land resources development and management. Mr Tuisese further explained that the Fiji economy has a narrow base and performance is heavily dependent on the performance of tourism and the sugar industry. In addition, Mr Tuisese said that Fiji’s obligation as a signatory to the United Nation Convention to Combat Desertification / Land degradation (UNCCD) is to provide measures to prevent land degradation and rehabilitate degraded land through a rural land use policy and plan. Mr Tuisese said that the development of a rural land-use policy for Fiji would see an increased public awareness on land resources, including soil, water and flora are interdependent and must be managed in an integrated way; and that the individual land user and the community have a responsibility for preventing and mitigating land degradation. Mr Tuisese said under the policy, there would be good governance strategies to expand and diversify sustainable economic activity, increase employment, added-value earnings and promotion of social development goals. He added that there would also be an effective Fiji involvement with, and contribution to, global issues that have laws related to the environment, rural development, sustainable land management, etc. HONIARA, Solomon Islands (SIBC, June 26) – The Temotu Provincial government in the eastern Solomon Islands has imposed a logging ban in its jurisdiction. The province, which includes a number of islands, says the new policy will only allow timer milling. Speaking to Radio Australia, Temotu Provincial Secretary Eddie Daiwo says this is because of the province's small land mass. He explains that although logging in the past had caused minimal destruction to land and the province's forest environment, the province had decided not to allow any more logging operation to sell round logs. Mr Daiwo says the ban on round export was introduced in 1992 under the premiership of the former Governor General Sir John Ini Lapli. He says people can acquire timber rights but this does not mean the Province will grant any logging license because it is prohibited in the province. In the 1960s major logging operations had taken place on vanikoro and Santa Cruz for the highly priced kauri tree on government land. Ms Vaisa Kama and Ms Varea Vaurasi from the University of the South Pacific Tissue Culture lab in Samoa are attending a one week training attachment at the SPC Regional Germplasm Centre. Vaisa and Varea are the technicians responsible for maintaining the duplicate RGC taro collection at the USP laboratory. This training is part of the collaboration between the two laboratories and ensures that there is uniformity in the methodologies being used for the conservation of the region's crops. As well as receiving training in the tissue culture techniques for the main root and tuber crops, they will also be trained in tissue culture of breadfruit and kava - both techniques are recent developments. From a Conservation International Press Release. Conservation International’s Center for Applied Biodiversity Science (CABS) and Intel Corporation today announced the re-launch of www.biodiversityhotspots.org, a vividly designed Web site containing detailed and updated information about the world’s biodiversity hotspots. Nine new hotspots also have been added to the original list of 25. Biodiversity hotspots are 34 regions worldwide characterized by remarkable levels of endemism, or having a vast diversity of native species. Today, these last remaining corners of biodiversity face exceptional levels of threat. FAO-SAPA, based in Apia, Samoa, has a website here. This is what it says about the role of the office: "Our tasks are to assist the government and local communities of the Pacific islands, in developing sustainable food sources, preventing environmental degradation and supporting stable, political development in the region. We aim to improve the well being of the people of the Pacific island countries through the application of agriculture, and with the management and sustainable development of their living resources. The Sub-Regional Office for the Pacific collects, analyses and disseminates information relating to nutrition, food, agriculture, forestry and fisheries. It provides farmers, scientists, government planners, traders and non-governmental organizations with essential information to make rational decisions on planning, investments, marketing, research, training. It also provides independent advice." This report describes the results of two standard techniques used for the initial diagnosis of plant viruses. As shown by the results, there was no indication of any viruses present in the samples taken from the 20 cultivars selected from the collection at NTBG by Dr Ragone. Despite its effectiveness as an initial screening test for RNA viruses (~85% of all plant viruses are RNA), dsRNA analysis does not detect DNA viruses nor all RNA viruses. However, examination of sap from the breadfruit samples also failed to reveal the presence of any typical virus-like particles. The apparent absence of viruses is consistent with the general consensus amongst virologists, that breadfruit is not affected by viruses. In the National Tropical Botanic Garden in Maui, Hawaii, no viral symptoms have been observed on the collection of some 120 different cultivars, over the period of time it has been established in Hawaii - since 1989/91. The 20 selected cultivars examined at QUT will soon be established in tissue culture. Tissue culture is an accepted method for safely distributing germplasm around the Pacific region, and is used for many of the crops of the Pacific. Countries will be able to request tissue cultures from the RGC. In doing this they will have to decide if there is any need for further virus testing of breadfruit, or whether they accept the results from this initial assessment in combination with the decontamination effects of tissue culture. HAKALAU FOREST NATIONAL WILDLIFE REFUGE, Hawaii (AP) -- Yellowed grasses cover the lower southern slopes of Mauna Kea where impenetrable koa forests once stood on the Big Island. But Hawaii's largest endemic tree, with its sickle-shaped leaves, has reclaimed some of its former territory over the last two decades. Conservationists and small timber harvesters have replanted koa on thousands of acres on the Big Island -- the local name for the island of Hawaii -- and Maui, increasingly fencing out the cattle, pigs and goats that forage on koa bark and seedlings. They hope replanting the slow-growing trees can help restore the feeding and nesting grounds of endangered native forest birds and quench demand for valuable koa timber, with a scarcity and a lustrous grain that rank it among the world's most expensive woods. A tree can take 40 years to mature. Koa trees are slowly recovering on the slopes of Mauna Kea at Hakalau Forest National Wildlife Refuge, which was set aside specifically for forest birds. Since the refuge opened in 1985, volunteers and refuge officials have replanted more than 271,000 koa trees on about 5,000 acres, with survival rates averaging 70 percent, said Baron Horiuchi a horticulturist for the U.S. Fish and Wildlife Service. More than half of Hawaii's 31 birds on the federal endangered species list are small forest varieties, according to the Fish and Wildlife Service, which oversees the refuge. Twenty-eight percent of Hawaii's 93 native bird species are already extinct, according to federal figures. The birds need koa to shelter the smaller plants they feed on, such as the red splayed blossoms of the ohia lehua, giant Hawaiian raspberries and marble-sized red ohelo berries. A spreading koa canopy protects seedlings and smaller plants from cold upland temperatures, which can dip into the 20s during winter on Mauna Kea. In many parts of the refuge, koa trees are the only native plants growing among the introduced species of weeds and grass. The branches on many of the larger trees at Hakalau grow in a serpentine network, an illustration of the name for this area, which means ''many perches'' in Hawaiian. Private koa farmers prefer the tall, straight-growing trees. They hope to harvest the semi-hard wood, which ranges in color from blond to red to dark brown, for furniture, bowls, musical instruments and traditional Hawaiian seafaring canoes. Umikoa Ranch on the Big Island, in partnership with state land officials, reforested 800 acres with koa trees between 1980 and 2004. David Matsuura, managing steward at the 2,000 acre ranch, said some of the trees planted about 15 years ago have already reached large diameters, although he isn't sure about the quality of the wood. Ranch managers said the trees have already helped re-establish native plants and animals, including eight endangered Hawaiian ducks. The return of koa has also increased water sources at Umikoa, where the sickle-shaped koa stems draw fog and moisture into the watershed. But profit is also a goal for koa farmers, who are gambling over the long term on a product that commands premium prices. At Hawaiian Koa Furniture in Honolulu, a 54-inch round koa table sells for $8,000. The bulk of the koa market is driven by Hawaii residents, who are the world's biggest consumers of richly varnished koa products. A TECHNOLOGY for making snowball tender coconut (SBTN) has been developed by the Central Plantation Crops Research Institute (CPCRI), Kasargod, Kerala. By using this technology, the husk, shell and testa of the tender coconut can be removed without breaking the nut and made available for consumption. Two persons can simultaneously operate the machine according to Mr. S.J.D. Bosco, senior scientist, CPCRI. The tender coconut is valued both for its water and its gelatinous kernel. Its milk is composed of water, protein, fats, carbohydrates, minerals like potassium, calcium and phosphorus and several vitamins. The kernel or solid endosperm of the tender coconut is a nutritious food for convalescing patients. The traditional method of extracting the husk from the tender coconut is difficult and time consuming. Tender coconuts of 7-8 months maturity are selected and a groove is drilled into the shell before scooping out the snowball from the shell cups. The machine is fitted with two blades connected to a 1 HP electric motor. Arrangements are provided for adjusting the depth of cut in the shell. According to Mr. Bosco, by using this machine, any unskilled person can make one snowball in five minutes, which through regular practice can be brought down to three minutes. The cost of the machine is valued at Rs.24, 000 and the cost of making one snowball is approximately one rupee. The snowball is white in colour and ready to serve. The white ball contains the tender coconut milk, which can be consumed by just inserting a straw through the top of the kernel. Since the coconut milk is not exposed to the atmosphere it retains its sterility. If the snowball is individually packed and refrigerated under hygienic conditions, its shelf life can be prolonged to more than 10 days. For more information on the new technology readers may contact the Institute at 04994-232893 or e-mail cpcri@yahoo.com. Coconut juice or bu has been a hit among the local Japanese people visiting the Pacific Pavilion during Fiji Week celebrations. The Fiji Booth which has been selling the drink at the Pavilion has had people returning for another taste of the bu. It has surpassed the rate at which other soft drinks have been sold by nearby pavilions, which sell large well known and popular food drinks. People coming to buy the drinks have ranged from the old to very young. The preference of the bu drink over the other soft drinks was merely because of taste and its ability to quench and satisfy thirst during the heat wave experienced at the Aichi exposition. The drink is selling at $11 Fiji dollars which is equal to 721 Japanese yen. The selling of the bu has also been significant because in essence it has created an observance of the theme of nature's wisdom in the way Fijians or Pacific islanders live in harmony with nature and their surroundings. THE National Forest Authority must put a stop to all logging in Papua New Guinea and re-assess the trend that logging has created in this country. Wuas Ubun, a forestry consultant with more than 10 years experience in forest related issues, said this when highlighting the negative effects continuous logging would have on forestry development in PNG. Mr Ubun said the NFA must make the best business deal for the country — to earn more than what it was earning and bring foreign exchange into the country. “Our current trend is that these logging companies are taking what they are earning out of the country. When PNG logs arrive in foreign countries, the logs are placed in a pool and are auctioned at a price that is five times more than what they are paying for in our country,” he said. Mr Ubun said proper planning and assistance must be given to the right people who want to see changes at the village level. He said people also want to see the government come in with their social, economical and agricultural contribution in the development of that particular area through kina for kina. Mr Ubun added that when the government does this, people would feel responsible to look after their resources. Mr Ubun also supported the call by Ecoforestry Forum and non-government organisations to political leaders not to pass the latest changes to the forestry Act. He urged all foresters not to sit back with their mouths shut but to come out and speak their mind. “It is our duty to see that first our people benefit through proper management of our forest resources and not allowing acts after acts and amendments done to the recent acts to deprive our people and ourselves,” Mr Ubun said. He added that the amendments to the Act would only further empower foreigners to take advantage over our country by these changes. In Fiji, close to 100 residents of Ovalau Island depicted their spatial knowledge on a 1:10,000-scale relief model assembled by students of local high schools. Data featured on the model (97 legend items!!) were later extracted and imported into a GIS environment for further use in the contexts of collaborative planning, NRM and cultural heritage preservation. I would like to share with you that as of last Friday 17 June, 2005, our Island Food Community of Pohnpei website at http://www.islandfood.org/ has gone live. As it says on the IFCP Home Page, this website has been developed to create further awareness about the importance of island food and to share information about our non-governmental organization and its activities. Jason Aubuchon and Pamela Joseph helped us tremendously on this and we would like to extend our thanks and acknowledgements to them. ....and last but certainly not least, a photo gallery of island foods and people!! We hope that this may serve as an educational tool and a showcase of the tremendous value and potential of local island foods, and to contribute to increasing the production and consumption of these foods for all the many reasons...health and economic benefits, food security, preservation of culture, agricultural biodiversity, self-reliance, and enjoyment!! Thank you again to the Centers for Disease Control and Prevention (CDC) and United Nations Children's Fund (UNICEF) for providing the funds for developing this website, and to our other funding agencies including the Secretariat of the Pacific Community, Australian and New Zealand governments, Task Force Sight and Life, Pacific German Regional Forestry Project, and the Centers for Indigenous Peoples' Nutrition and Environment, as well as the universities and many other collaborating agencies with which we are partnering. Since the thriving galleon trade between New Spain and the Philippines first brought the seedlings of the Manila mango to Acapulco more than 200 years ago, Mexico has gradually made the fruit its own. It now wants to officially adopt the name, but the Philippine government is fighting custody. In the globalized 21st century, as both countries seek to expand exports of mangoes and other fresh produce to nations worldwide, Mexican growers have launched an effort to obtain a socalled geographical indication or domain of origin for the Manila mango, a type of patent that would restrict the use of the name Manila to mangoes grown in Mexico. A domain of origin certifies a product's excellence, increasing its exports. It also protects its name from infringement by others in this case, growers in the Philippines, where mangoes are now produced under the name Manila Super Mango, or Carabao. The Manila mango does not pose much of a threat to the Philippines currently; it represents less than 1 percent of Mexico's mango exports due to the variety's fragility and a fruit-fly problem, the latter of which is also an obstacle to obtaining the domain of origin. "We are still a long way from obtaining the denomination," said Jorge Mendoza, a member of the state committee for mango production in the Gulf coast state of Veracruz, where most Manila mangoes are cultivated. But Mexican mango growers do hope one day to achieve it. They would like to convert the small, pale-yellow Manila whose delicate skin and intensely juicy flesh makes it one of the nation's favorite domestically consumed mangoes into an export success, including in markets targeted by the Philippines. In the meantime, Mexico already is gaining some mileage from the Manila name through other mangoes. In the United States, the name "Honey Manila" is often applied to the widely exported Ataulfo variety from southern Chiapas state, "because the Americans can't pronounce 'Ataulfo,' " said Blanca Nelly Partida, a representative of Mexico's national mango export association, EMEX. The Filipinos don't want to lose the right to use a name that originated in their country or to see Mexico profiting unfairly from it. They also have hinted that they might try to obtain the domain of origin for themselves. "Mexico acknowledges that their Manila mango variety came from the Philippines," said Adrián S. Cristóbal, director-general of the Philippine Intellectual Property Office, or IPO. "By using the name Manila mango, the public can be misled as to the true origin of the fruit. ... This is essentially unfair competition." Cristóbal said government officials may resort to the international Agreement on Trade-Related Aspects of Intellectual Property Rights, or TRIPS, which allows nations belonging to the World Trade Organization to stop other members from obtaining a domain of origin if it misleads consumers as to a product's true origin. The way Mexico sees it, the Manila mango long ago became a product unique to this country. Although Manila seedlings arrived in Mexico from the Philippines in 1779 during the galleon trade, the variety was crossed with other mangoes over the years, so today's Manila mangoes possess a genetic mix found only in Mexico, said Héctor Cabrera, an expert with the National Institute of Forest, Agricultural and Livestock research. "It shouldn't be confused with the original Carabao," he said. Mexico, the world's largest mango exporter, shipped more than US130 million in mangoes in 2004, the majority to the United States, with smaller markets in Canada, Japan and European countries, respectively, the Economy Department reported. The Philippines shipped US31 million to its four top markets in 2004: Japan, Hong Kong, South Korea, and China, according to the country's trade department. Both countries are looking to expand their mango export markets, raising the level of competition between them. Seeking domains of origin is an extremely strong trend in today's cutthroat global economy, where companies are fighting to keep a competitive edge and not leave themselves unprotected, said Mexico agricultural economist Yolanda Trapaga. But the Manila mango case is uncommon and could have an impact on other products in the future because it redefines the label's traditional concept of origin, Trapaga said. While the designation usually is based on a product and where its from such as the town of Tequila, Mexico, or the province of Champagne, France the Manila mango's domain would refer not so much to the fruit itself as to the hybridization and cultivation practices in Mexico that supposedly make the variety unique. All countries seeking the domain of origin must comply with WTO rules. But because the WTO does not currently recognize, or regulate, the domain of origin, most countries seeking the designation work out mutually acceptable agreements with their trading partners, Trapaga said. Mexico's next step, therefore is "to start hashing this out with the Philippines," she said. "There has to be a bilateral negotiation, to see where it goes." The following message is posted on “PGR News from the Pacific” on behalf of Aroha Te Pareake Mead. You can contact Aroha for further information at aroha.mead@vuw.ac.nz or aroha@earthcall.org. This notice is an official announcement of the formation of a Conservation and Culture Working Group (CCWG) within the Commission on Environmental, Economic and Social Policy (CEESP) of IUCN-The World Conservation Union. We are now at the point of establishing a membership and hope that people from the Pacific will contribute their knowledge and skills to the group. The CCWG has emerged out of a concern that the 'conservation establishment' has not taken a sophisticated approach to a consideration of the role of culture (broadly defined) and cultural politics. The group is meant to rectify that and you can read more about the goals of the group and a description of activities and goals of the group in separate documents available on request. This is not written in stone and we hope that it will develop as the group engages in specific initiatives over the next few years. We have also included a membership form and hope that you will all take the time to fill it out and return it to the contacts listed at the bottom of the form. This will help us to develop a profile of the group membership and promote the activities of the group to relevant interests. At this point, we also need to establish a work plan to guide our activities over the next three years. We understand that different people in the group have different interests in the general subject area and we would be grateful if you could provide some feedback over the next few days to see what you would like the group to accomplish. The CMWG (Collaborative Management Working Group) has focused on knowledge generation through publications, but we would like to tread a different path. One of the things that we would like to see happen is the development of an inventory of formalized protected areas (again broadly defined) that have an explicit cultural rationale (e.g., the recently established Vilcanota Spiritual Park near Cusco, Peru). Terra Lingua has begun this effort and we would like to see it continue to grow. We would also like to develop a series of longitudinal studies of such areas through which we might make clearer explicit and dynamic relations between belief systems, material practice and conservation outcomes in particular locales over specific time periods. It seems to me that this is what's needed to respond to the reactionary positions of most conservation biologists whenever the relation between conservation and culture is raised. We were appalled at the dominant attitudes we encountered among 'pure scientists' at the World Parks Congress in 2003, and believe that we need a sophisticated program of cultural research devoted to conservation to challenge the 'culture' of conservation science. Finally it would be wonderful if we could somehow find the funding to hold a conference or a workshop through which we could take stock of the state of knowledge, and have an open debate of sorts on relevant issues. This might culminate in a series of publications prior to the next World Conservation Congress. We would also like to establish regional correspondents to inventory and keep tabs on developments in particular geographical regions. We hope to develop a database engine for the website that we can use for entering relevant information. That's it for now. Once again, we'd be grateful if you could fill out the membership forms and pass along your input to help structure a general workplan. We will have the discussion list up and running soon and look forward to productive relationships over the next few years. IT is unusual to find women living in villages on the mainland still enjoying the art of weaving mats these days. On the outskirts of Tavua is Drauniivi Village where most of the inhabitants depend heavily on income from the Yaqara Pastoral Farm and the Fiji Water. There is no stress over employment. But among the coastal village is a hardworking woman who supplements the family's income by weaving mats which she sell. Age has crept in for Makereta Raisole but the tireless mother-of-two takes pleasure in what she does every day. Weaving is a daily chore for the 49-year-old and she says it means extra earning to supplement what her daughter earns at Yaqara. "I enjoy weaving. I've known how to weave since I was a little girl and selling mats has been helpful to our daily living," she said. "At the start, I thought of making mats to sell to help my daughter who works at Fiji Water. "Now over the years, it's been very helpful to the daily needs of our family," she said. Like other women in the village, Makereta also goes out fishing to sell but weaving is her main source of income. She earns more from selling mats. Some of her orders come from long distance for special traditional occasions. Her day usually starts with the daily housework before she sets out to collect pandanus (voivoi) leaves. After collecting the leaves, she piles it in a heap and walks back to the village along the King's Highway with the pandanus leaves on her back. The hard part is the preparation of the voivoi leaves. It is cooked and left in the sun to dry. 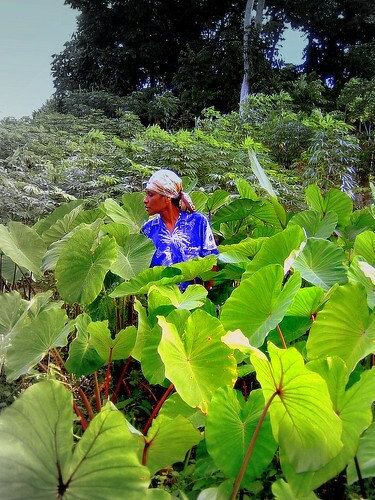 After that, she prepares the leaves before she starts weaving. It takes several days or a week or two for a mat to be weaved, depending on size. "It's not an easy task and requires a lot of patience. "You have to have the passion for it in order to make it through," she said. "I usually receive orders from women around the village if they are preparing for special events such as a wedding or a birthday," she said. Apart from the usual mats, she also weaves a variety of special mats such as the Vakabati, Coco, Katu-dua and the Katu-rua. Makereta is one of the few women in the village who is still utilising her talent well and reaping great rewards at the end of the day. She says young Fijian women should not forget their roots. They should be taught in the art of weaving mats and other handicraft. It is an asset for a young Fijian woman and can earn her money. The interactive diagnostic key to sweetpotato problems "Sweetpotato DiagNotes" has been launched for internet access at http://www.lucidcentral.org/keys/sweetpotato/. CDs will be available in about one month's time. CD requests can be emailed to cbit@uq.edu.au. Feedback is most welcome, and please report any problems or errors so they can be corrected promptly. Send feedback to Jane O'Sullivan at j.osullivan@uq.edu.au. New Guinea's coconut industry badly needs a marketing infrastructure with a network of entrepreneurs to bring the farmers' produce to the market as finished goods. "The industry needs to identify potential entrepreneurs who with training and finance can develop a marketing infrastructure that works with economies of scale to benefit the growers," said Dennis Hill, managing director of Tropic Frond Oils Ltd at Kerevat. Speaking on "Downstream processing and marketing of coconut products" at the coconut seminar in Port Moresby, Mr Hill said if the industry is serious about downstream processing of its coconuts, "then we have to be able to produce products to a standard that is equal or superior to available products in the market, not only of the product itself, but its packaging, presentation and marketing and advertising". Tropic Frond Oils is taking steps to increase production of virgin oil. "We believe there is a market out there but the value adding may well be in producing an edible product in its final retail packaged form. "The real potential however will not be in virgin coconut oil but in certified organic virgin coconut oil," he said.Tropic Fronds plant includes three-tonne per day copra oil mill and a soap making plant with a capacity of five-tonne per day. "Needless to say we do not operate these plants at full capacity. We started the company 11 years ago with the objective of exploring commercial opportunities for the downstream processing of copra. ""Most people would be familiar with the "Curls" range of skin and hair care products, which are sold throughout PNG and with some exports to Australia and the Solomon Islands. ""We took a traditional product, improved upon it, packaged it, branded it, advertised it, and made it a relevant accessory for the 21st century," Mt Hill said. "We are proud to have brought an ancient custom into the mainstream of urban life in PNG. Our 'Vulcan soap' would not be well known here in Port Moresby ... in fact anywhere outside the New Guinea Islands region, and while it is an excellent product when we talk about downstream processing, we must remember that there are other competing products in the market," he said. From Dr Lois Englberger of the Island Food Community of Pohnpei (IFCP). I would like to share with you a little about the Youth to Youth Fair 2005, held May 27 at the Pohnpei Gym, and IFCP's involvement. There were over 500 people participating, including students, teachers, parents and others. This is a program of the Conservation Society of Pohnpei (CSP). Although I was not able to attend, those from CSP running the program (Nick Donre assisted by Ben Namakin) contacted me and shared with me about how inspiring it was to see the presentation by the Seinwar students on conserving the rare banana varieties of Pohnpei. At the Youth to Youth Fair, the Seinwar students passed out banana recipes that they had learned to make during the year (Karat Bread and Daiduhs-Taiwang Pancakes). Some students even brought samples of those dishes so that people could try. They explained how they had learned about the different Pohnpei bananas and how valuable they are for our health and even used the term beta-carotene, which is the most important of the provitamin A carotenoids, the precursor to vitamin A that is contained in the yellow-fleshed varieties. The students said that it is important to protect these varieties, because if any of the varieties were to be lost, it would not only mean that they would be losing that banana, they would also be losing a part of their culture. Students also explained that after the session on planting Karat, they planted rare varieties with their families on their own land. Youth to Youth is a program involving selected schools each year and working with the Class 6 schoolchildren. Certain topics of conservation have been chosen for raising awareness among children. The Island Food Community of Pohnpei was invited to join the program last year and to work in the area of the conservation of rare banana varieties. Classes are held monthly with the students throughout the school year. This year IFCP worked with the Class 6 students at Seinwar. Amy Levendusky (Peace Corps Micronesia), Yumiko Paul (Pohnpei Department of Health), Engly Ioanis (College of Micronesia-FSM Land Grant), Ben Namikin (CSP), and I facilitated the different classes, which included lessons on the Pohnpei Bananas poster, a cooking class, a Karat planting class, along with quizzes and prizes to those students writing down the right answer or being able to list the greatest number of carotenoid-rich varieties. The Task Force Sight and Life, a humanitarian organization in Switzerland, provided cloth bags as prizes for the winners in three sessions, and IFCP Banana calendars were provided as prizes to students for another quiz. The Pacific German Regional Forestry Project provided funds for implementing the classes. One of the highlights for the year was a field trip to the Pilot Farm Banana Genebank Collection, which has over 30 Pohnpei varieties of bananas, all carefully labeled. This is a project of Pohnpei Agriculture, led by Adelino Lorens. CSP is now working with the Micronesian Seminar to put together a video for broadcasting on the local Pohnpei television. Be sure to watch if you can, and join in the excitement of the Seinwar youth for the wonderful bananas of Pohnpei! The following short piece appeared on ABC's Pacific Beat today. Fair trade, rather than free trade, is the philosophy of a Sydney-based company now producing virgin coconut oil products in four Pacific Island countries. The company - known as African Pacific - is currently working in Fiji, Nauru, Kiribati and Solomon Islands and is in the process of expanding to other Pacific Island nations. Its biggest project is on the Wainiyaku Estate, on Taveuni Island in Fiji. The organisation's philosophy is all about putting non-exploitative working conditions and a fair price for producers, above profit.